The unique architecture of Melnik and the nearby Rozhen Monastery make it a popular tourist destination. The town is also associated with the impressive natural sand pyramids in various forms, resembling giant mushrooms, ancient towers and obelisks, spread in an area of 17 km² near Melnik, Kurlanovo and Rozhen. The town has also been famous for producing one of the best and strongest wines in Bulgaria. 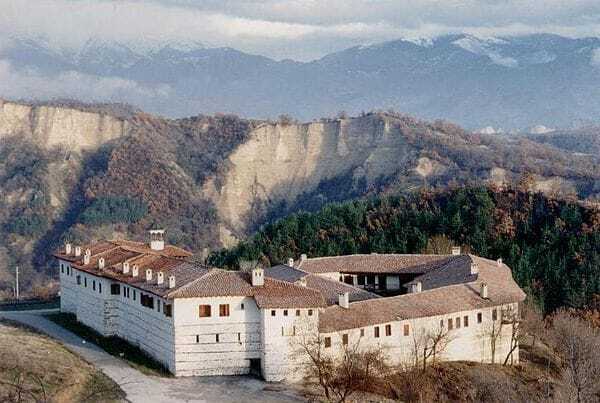 Rozhen Monastery is the biggest monastery in the Pirin Mountains in southwestern Bulgaria. It is one of the few medieval Bulgarian monasteries well preserved until today. The earliest archaeological evidence of medieval life at the place is a grave with a few coins and decorations from the time of Byzantine Emperor Michael VIII Palaiologos (1259–1282). Some other items also date to the 13th century while the marble frieze above the central gate of the church dates to the 13th or 14th century. A couple of new buildings were constructed in the monastery at the time of Despot Alexius Slav. The earliest written source testifying to the monastery's existence is a note on a chant book from 1551, today in the Great Lavra library on Mount Athos.